LAS VEGAS -- Undefeated former two-division world champion Terence Crawford is universally recognized as one of the top boxers on the planet, and he is moving up in weight to seek a world title in a third weight division. Standing in his way is the tough-as-nails welterweight world titleholder Jeff Horn, who is also unbeaten and quite confident that he can pull off another monumental upset after controversially outpointing the great Manny Pacquiao to claim a 147-pound belt last July before 51,000 spectators at Suncorp Stadium in his hometown of Brisbane, Australia. Crawford vs. Horn: Who will win? Crawford's aim is to prove he belongs in the talent-rich welterweight division and continue his ride to stardom. Horn's aim is to prove that his unexpected victory against Pacquiao was no fluke. We'll find out which side accomplishes its goal when the two fighters meet in the main event of the Top Rank Boxing on ESPN card on Saturday night (ESPN+, main card beginning at 9:30 p.m. ET) at the MGM Grand Garden Arena. The entire card will stream live on ESPN+ beginning at 6:30 p.m. ET. "It's a brilliant fight between two unbeaten fighters. These two are both 30 years of age, both in their prime and it's going to be a phenomenal fight on Saturday night when two unbeaten forces collide," Glenn Rushton, Horn's trainer, said. "It's going to be exciting." This is your Ringside Seat for the fight. Crawford, of Omaha, Nebraska, was the 2017 and 2014 ESPN fighter of the year and is a former lightweight world champion and former undisputed junior welterweight champion. Last August, he became only the third fighter of the four-belt era to unify all four major sanctioning body titles when he blitzed Julius Indongo in a third-round knockout to take his two belts and become the undisputed champion at 140 pounds. 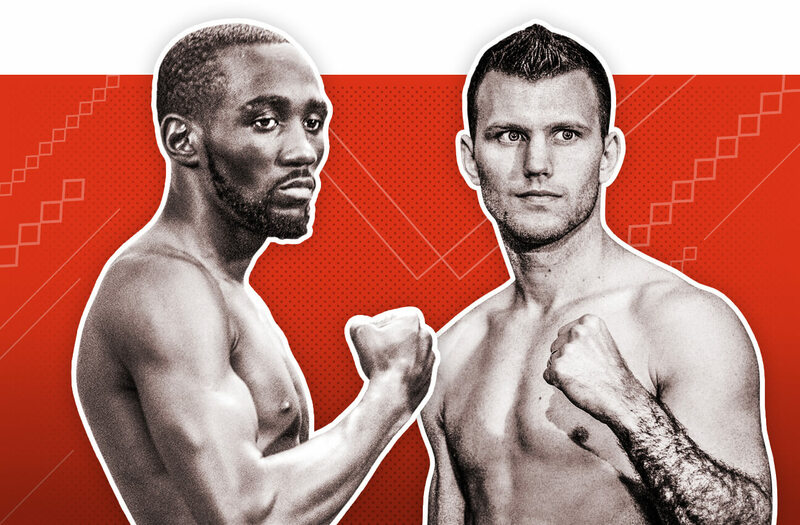 Crawford considered staying at the weight, but without any marquee fights to be had -- and with making weight becoming increasingly difficult -- he opted to throw his hat into the deep 147-pound division beginning with this mandatory shot against Horn. "I feel like I'm in the same boat right now as when I was coming up in weight [to junior welterweight]," Crawford said. "Thomas Dulorme was a 147-pounder, and he came down in weight to fight me for the [vacant] title and everybody was saying he was this big, strong puncher and saying that I was too small. But I went for it and I prevailed, and I feel like I'm in the same predicament when I was moving up from 135 to 140." Crawford said he was comfortable at the new weight and expected to be as explosive as ever. "I am going to be stronger. I am going to be faster. My boxing ability and my IQ are already there," he said. "I'm going to be a lot stronger. Will he be ready is a key factor. My speed is still there. My power is better. I am only going to keep getting stronger and stronger. I am going to be ready, and come Saturday, I will answer all of the questions." Top Rank chairman Bob Arum, who promotes Crawford and co-promotes Horn, has compared Crawford to Hall of Famer Sugar Ray Leonard, who rose though several weight classes. "Terence Crawford in my mind is the superstar in boxing. He dominated as a lightweight champion, won all of the belts as a junior welterweight champion and now he goes up to fight the welterweights," Arum said. "The first step is Jeff Horn, who is a big, strong welterweight, and Terence believes he is up for the challenge, and every obstacle that Terence has faced he has overcome. He is in my mind like one of the throwback fighters to the '80s. We compare him to the great Sugar Ray Leonard, and I think the skill and artistry of Terence in the ring is something to see." After Horn's stunning decision win against Pacquiao, he made his first defense, also in Brisbane, in December and was the heavy favorite against England's Gary Corcoran, whom he stopped in the 11th round of a dominant performance. Now, however, Horn is back to being the heavy underdog against the faster, more technically skilled Crawford and comes off as completely unmoved by his status. Although he had nothing to do with scoring the fight against Pacquiao, he was heavily criticized in the aftermath and is very aware of the sometimes crushing negativity surrounding his win -- one for which Pacquiao declined to exercise his contractual right to an immediate rematch. This week Horn, who reached the quarterfinals of the 2012 Olympics, talked about being referred to by some as a "fraud" and "chump," but he has seemingly not let it bother him in the least. "It has definitely been a hard road to get to where I am," Horn said. "I had to fight very hard. The mindset is that I am coming in as an underdog even though I am a world champion. I have had to fight some messy fights, and when I can start showing myself to everyone around the world is when I can start thinking differently. "I don't think about the underdog status. I had that before in the Manny Pacquiao fight. I will do what I did for that fight and that is not worry about that and just worry about what I'm going to do in there and make a fight of it and be competitive and win. Just keep thinking along those lines." Horn has fought all of his fights in either Australia or New Zealand and will be fighting in the United States for the first time. He arrived in Las Vegas last Wednesday to give himself time to adjust to the time and weather differences. Convincing him to travel for the fight was not difficult. "It wasn't that hard, I guess. The money was right for this fight," said Horn, a married father of a newborn daughter. "I was always thinking that I was going to go to America anyway and have a fight, so why not now? It's not like we were trying to stay in just Australia. We know we need to fight all around the world to build my reputation." Horn traveled the world during his amateur career, so Rushton said it was no big deal as pro. "We are used to traveling. We know how to travel," he said. "We can adapt quickly in the different time zones, so for us, it's not a problem. We anticipated it would take us three or four days to settle in properly to get back to his very best. Now he is back to his very best. We are good to go come Saturday night, and it going to be a heck of a fight." Horn and Rushton said they were not concerned about getting fair judging on the road should the bout go the distance. The judges are Adam Height of Australia, Nevada's Burt Clements and Italy's Guido Cavalleri. "I should be able to win a decision in America. If they are judging fairly and I am throwing more punches and landing more punches, then the judges should be seeing that and scoring me the rounds," Horn said. Said Rushton: "I believe that we can win a decision. I don't think that's going to be a problem. I do believe that the judges all around the world are very good. Judges are incredibly competent, and they do their very best to arrive at an accurate round-by-round verdict. So, we should not have a problem." Crawford won his lightweight world title in 2014 by going to Ricky Burns' turf in Glasgow, Scotland, and winning a clear decision. He said traveling wasn't a big deal to him. "For me it wasn't hard because I already know what I was going over there for, and I wasn't gonna let anybody step in the way of me conquering my dreams, and that's becoming the world champion," Crawford said. "So I don't know what's his train of thought or what his mind frame is coming in here. But me, personally, I'm not gonna let him leave with that title. He's not going back home with it." The fight was originally scheduled for April 14 but was postponed when Crawford suffered a deep bone bruise on his right hand while training for the fight. It was rescheduled for Saturday but not without a slight bit of controversy because the Horn team questioned the legitimacy of the injury. "It was frustrating at the time because I was in hard training, and it was only a few weeks out and it was cancelled, and it was frustrating because I knew I had to do that hard training all over again," Horn said. "I didn't see any evidence that there was any damage, so it may have been just a tactic. So, I had to start over again." Said Rushton: "We have no ill feeling toward the Crawford camp, but this is a fight. Obviously, we were a bit annoyed with the date change. There was no evidence of any injury provided to us. We just heard of a bruised hand." Crawford said the Horn camp can say whatever it wants, but that the injury was legit. "I was real serious. It was a deep bone bruise," he said. "On the X-ray it looked like the bone separated, but it's healed now, and everything is a go." Rafael's prediction: Crawford by late stoppage.